Rebellion is the main battle theme for Ragna the Bloodedge in the BlazBlue series. 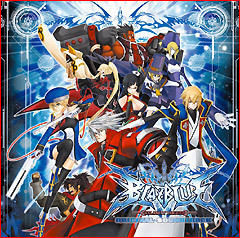 The original instrumental version introduced in BlazBlue: Calamity Trigger by Daisuke Ishiwatari and Yoshihiro Kusano. Rebellion (L.A. Vocal Cover), which can also be known as either simply Rebellion, or Rebellion LA is the vocal version of the track. Featured exclusively in the BlazBlue in L.A. Vocal Edition Album, with vocals by Jamison Boaz. An arrangement introduced in BlazBlue: Chrono Phatasma by YUHKI. A rearrangement introduced in the anime BlazBlue: Alter Memory. You can never go back to the past. Why are you living in the pain and the grief of losing one? Lose it! Lose it! Lose it! Go! Get rage! Get rage! Just get rage, damn it! 'Cause you believe it's brave! Even though it's colder than death, you'll break everything. So everything broken is brave! Go down with darkness now! So fly into a rage! In a poll run by the magazine Weekly Famitsu, Rebellion ranked 2nd in a survey that asked, "What was your favorite BlazBlue song?" In episode 11 of Blue Radio Ace, Rebellion was ranked 2nd in a BlazBlue survey that asked, "What is your favorite song?"